It feels so good to get into my crafty space and sit down and create. Today, I saw the challenge image at Color Throw Down and I immediately knew what I wanted to create. Its been ages since I just played with my ink pads. I have a lot of them, and they have been neglected lately as I have been in coloring mode. Avery Elle's Oh Happy Day stamp hadn't been put away yet, so I played with its lesser used elements. It consists mostly of sentiments. There are two little flower images along with leaves and center dots as well as the sentiment. After I made my first card front, I made 4 more. 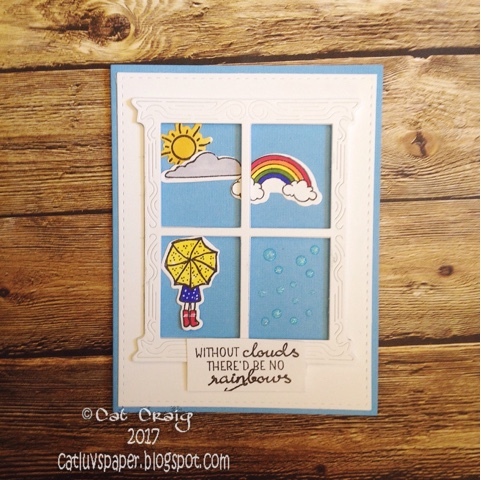 I had such a good time just stamping with SSS inks in Duckling, Blue Jay and Green Leaf. I didn't stop at the card fronts...I decorated envelopes as well. Here is my card, and below the set. I mounted the card fronts on yellow, blue, green, and cream. The back flap was stamping similarly to the card front and then a little posy of flowers on the front just under the return address area. I have missed playing along with Muse the last month so, I am happy to play this week. Our Muse is SonjaK and she's given us a lovely hydrangea, vellum, and kraft creation. I was inspired by that lovely hydrangea and the kraft cardstock. I used Ellen's Mondo Hydrangea and Prismacolor Pencils in several shades of green, pink, red, yellow and white. I minimally blended my petals with gamsol, and added some texture through white heat embossing and some nuvo dots. This week at Word Art Wednesday it is Anything Goes. The verse this week is "So teach us to number our days, that we may apply our hearts unto wisdom". At the Male Room the challenge is Colours - to use Black, White and 1 pop of color. I focused on the word Number and the color cue to combine the two challenges into one card. The number pattern background stamp is from Hero Arts, it was very black, so to tone it down I placed a piece of heavy vellum over it and then layered my sentiment frame and balloons over the vellum. Three more birthday cards to go this month. Now that I am back from my get away in CA, and have had almost a week to settle in it is time to play in some challenges and take a break from the Easter Cards. I am combining The Card Concept's Purple Haze ( I was inspired by the color purple) with this week's Freshly Made Sketches-sketch for a clean and simple card. Three more birthday cards to go this month! Thanks so very much for stopping by, your time is appreciated - especially if you choose to leave a comment. Enjoy your day! 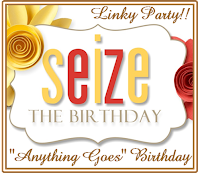 Seize the Birthday's current challenge is for Black and White and the topping is one more color. I took a bit of license...my white is just a touch creamy because I used watercolor paper. My pop is green. A friend is having a birthday and her favorite color is green. 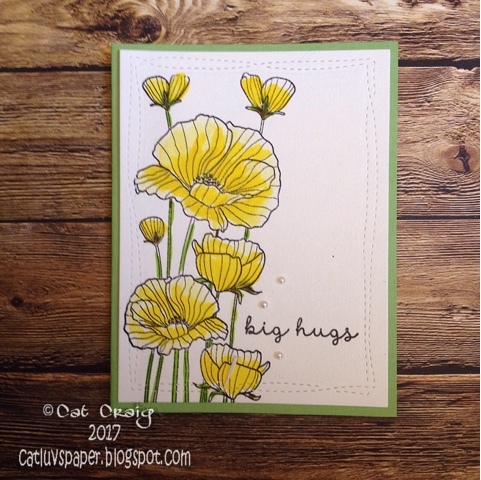 Sentiment by Stampin Up, Dies by MFT and Paper Smooches. I am back in Maryland after visiting my Dad in California. I was happy to spend time with my Dad...we shopped, ate, saw movies and played with the cats. There are three now, my Dad took in a little stray girl kitten who had been hanging out in the back yard. She is wild, but has warmed to my Dad. She even let me get a couple of pets in. As hubs was hunkering down waiting for the ice storm, I had my toes in the sand at Newport Beach. My Dad and I attended the BNP Paribas Tennis Tournament in Indian Wells while I visited. It is a spectacular tennis venue with two stadiums and several side courts. That temp shot was at night, during the day it was 90+ degrees; so glad it wasn't me on those courts. And no trip to California is complete without a stop at In-n-Out Burgers, its a classic. Now that I am home and unpacked; I took a look at my April birthday list...7 cards need making and I haven't started the Easter cards either. Time to get busy. First up, for my BIL. I love this embossing folder from Anna Griffin...it is perfect to give an little extra punch and drama to a masculine card. No bling, but some vellum under the sentiment strip, and a few white Nuvo drops for added texture. I was inspired by Michele's last posting. During my 2 weeks plus visit to my Dad's home in California, I had hoped to get a little crafting done. I brought a Hero Arts Sentiment set, Inktense Pencils, a set of Alcohol Markers (Colorit-set of 50 with a cool case) and several pre-stamped panels and stamped die cuts from Betty and LaVon. While here I purchased some Spectrum Noir Watercolor Markers (I am underwhelmed with first use...but that might be the paper will give another shot with my usual paper back home). I have a set of colored pencils that I leave here. 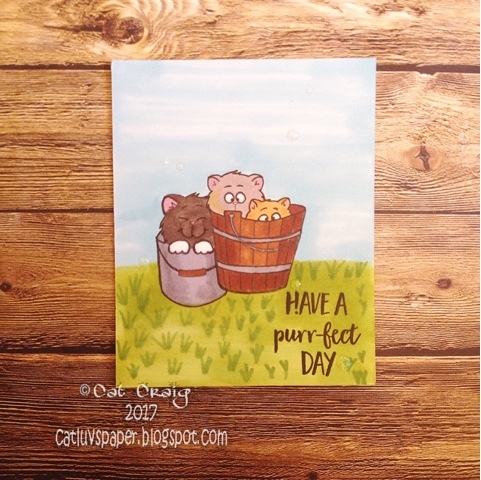 My Dad and I had a shopping day in Orange County and we stopped by Stamp Fever where he picked up my tab...I was good- I picked up two stamps -- the Daffodils by Stampendous and a cute set of cats by Gerda Steiner. A quick post from my IPad. I was lucky enough to participate in Greta's Hero Arts Scramble last weekend. Luckily among the pre-stamped panels I brought with me to California, I had the Hero Arts Delicate Blossom, which was part of a happy mail pkg from La Von. Thanks so much for stopping by! As soon as I saw this Penny Black collage stamp, I knew the first colors I would want to use would be a coral/red and an aqua blue, and definitely my copics...it was time for them to come out to play again. The sentiment strip and butterfly are mounted above the flat panel, they are part of the original stamp, I stamped the lower portion twice so I could raise that up a bit. I admit to stealing that idea from my crafty friend Peggy...she was with me at a crafty gathering when I brought this stamp along...and she mused that it might be fun to fussy cut the butterfly. I put foam dots under the upper wings so that they almost flutter. This is another predated post while I am on the road. Thanks much for stopping by! A quick post, I am visiting my Dad in California. So this is a scheduled post incase I have no time to make and post a card while I am away. 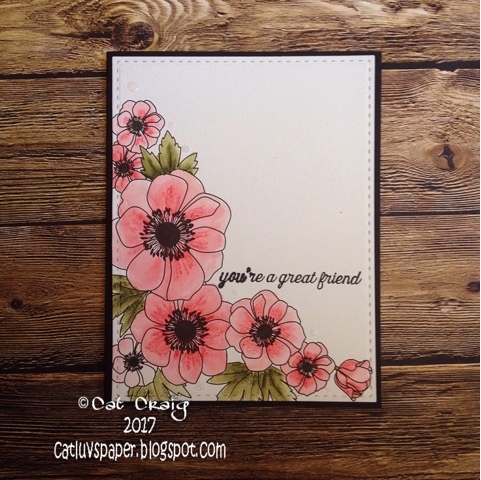 The flower set is by Stampin Up, colored with water color pencils and the die cut for the panel is from PTI. The sentiment is from Hero Arts. 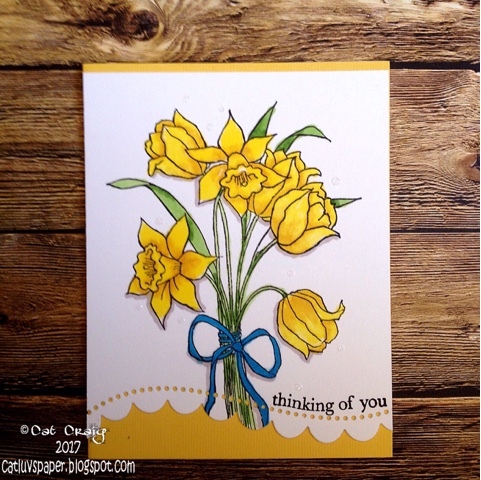 A friend was ailing, so I hurried and made a card to mail as soon as I heard. I need to have more of this kind of card on hand. I love this set by MFT. I found a few card photo's that I haven't posted yet so I am going to get them done. The first two were created while crafting with my crafty friend Peggy. I had just discovered watercolor pencils. These were brusho experiments. I wasn't fond of the panel, but when I cut it in half and made small thank you note cards...I kinda liked the messy artsy look. Today I host the Scramble over at the Hero Arts Flickr group. My theme was to create a focus panel, then CUT it up to make a card. Sometimes we just need to have fun and make fast cards. I made 3 panels and turned them into these 6 cards in less than two hours. 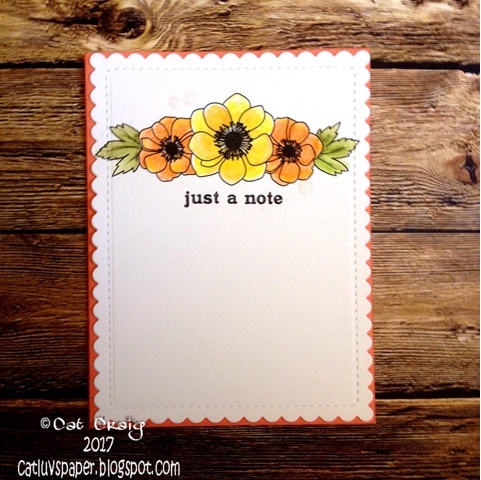 They are bright and cheery, and perfect for a quick little note. The scramble runs until 1:30 PM EST, here is the link to play or check out what the participants have done. Hi there, this month I landed behind my friend Greta. Of the options available I used embossing and used both heat and dry embossing for my card. Somehow I couldn't bring myself to put a sentiment on the front. The stamp is Winnie and Walters new Bed of Roses. I couldn't resist it when it came out, fab price point and so much can be done with these lovely line drawn roses.